Rowing is an excellent and safe activity to stay in shape working all of your major muscles as well as being an ideal cardio-vascular activity. The rowing motion makes it a low impact sport making it safe for people of all ages and levels of fitness. A rowing machine will provide one of the best all-around workouts. Not only will it provide a great aerobic workout but it employs most muscles of the body including the arms, legs, chest, stomach, and back. You determine the pace, but most rowing machines including air rowing machines, magnetic rowing machines, and water rowers have some form of adjustable resistance to increase the intensity of the workout. If you can only afford one piece of fitness equipment you won't go far wrong with a rowing machine. However, they do not appeal to everyone for reasons that will become clear later. Rowing is second only to cross-country skiing in overall muscle management, using over 82% of the body's muscles. It also works most of the body's joints through a significant and beneficial range of movement with virtually no impact. Air Rowers - Often referred to as flywheel, these rowers rely on resistance provided by wind. This is caused by the fan blades attached, which in turn cause the flywheel to spin. The resistance can be altered depending on the strength of the pulling motion used. At present, the Concept 2 rower is proving the most popular air resistance rowing machine. Water Rowers - At Fitness Superstore we offer the First Degree Fluid Rower and the WaterRower range. The idea behind water resistant rowing machines is to emulate the dynamics created by a boat in the water. Apart from the sound of the water, these machines offer a silent fitness workout. Magnetic Rowers - These rowing machines offer smooth and variable resistance, invariably found in gyms. In addition, they are virtually silent utilizing a magnetic brake system that produces no friction. We offer a wide range of magnetic rowers with the Kettler Coach rower proving very popular. How does the movement ‘feel?’ This is a critical question to ask. It must feel smooth at all times from the beginning of the stroke to the very end of the stroke. Is there a jar at the start of the stroke? if so this could put a strain on your lower back. The seat should also run smoothly and quietly over its monorail. Spend some time on the rowing machine if you can. After you should not feel any discomfort on your knees, back, shoulders or hips. All rowing machines should provide adjustable resistance so that you can vary the intensity of your workout. This can take the form of magnetic resistance. On a magnetic manual resistance rowing machine, you physically turn a knob, which moves the magnet closer to the metal flywheel, slowing it down. Electromagnetic resistance can be done by the push of a button. These rowing machines can also of providing preprogrammed workouts. The drawback of magnetic rowing machines is the resistance is limited to the strength of the magnet force that is generated. 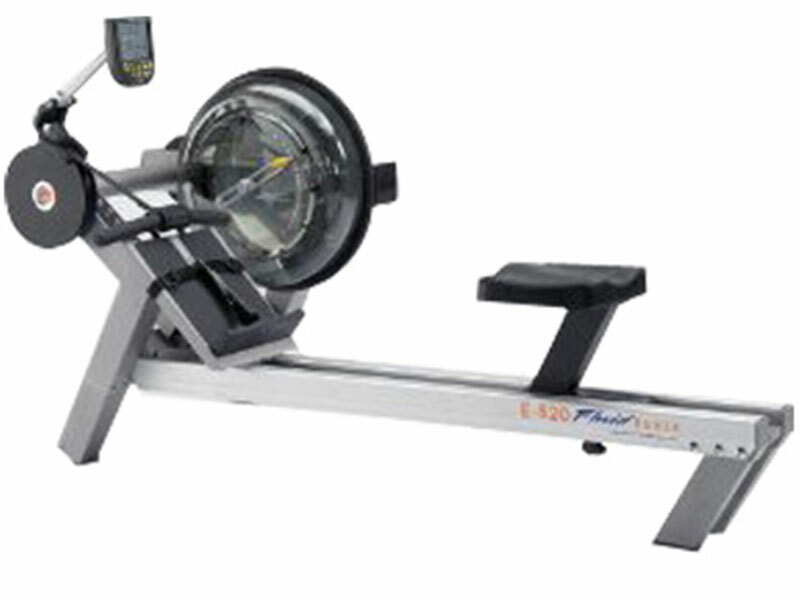 Air rowing machines use a fan wheel and are the most popular type of rowing machine. The most famous of these is the Concept 2 rowing machine, but the Vision AR700 rowing machine and the Horizon Oxford rowing machine are very good alternatives for those whose budget cannot stretch to the Concept 2 rower. By rowing harder and faster on an air rower you generate more airflow through the fan, which in turn increases the resistance, although some of these rowing machines also use a manual dampening system to increase the resistance further. Finally, you have rowing machines that use water such as the WaterRower. This rowing machine provides a very natural feel and you also get the soothing sound of rushing water. The basics from a fitness point of view are time, distance and speed. Having a measure of calories burned can also be motivating. Consider what additional information is important to keep you motivated day after day. Electronic rowers use magnetic braking and are very quiet in use, but tend to lack the feel of top quality air and water rowers. Air rowers can offer a very high standard of movement and accuracy of feedback but can be a little noisy. Water rowers create the closest feel to actually rowing on water and provide a wonderfully soothing swishing sound to boot! Look for chains or straps, which give a positive feel to the oar action without any stretching or give as you accelerate the oar. How clear and comprehensive is the displayed information? How easy is it to access programmes (if there are any)? Are the buttons clearly visible and easy to use? The seat should feel comfortable, even after rowing a few thousand meters! Move the seat to one end of the rail and tilt that end of the rower up a couple of inches - a good runner and rail will allow the seat to roll freely to the other end with a tiny amount of tilting. Does the oar feel comfortable to hold? Does it offer good grip, even when your hands are becoming tired and sweaty? Rowing machines generally are amongst the most compact of home Fitness Equipment but tend to have a long, narrow footprint. Some can be stored upright, useful if you're tight for space. With a rowing fitness machine, you use a lot of the muscles of the upper body. This means that the smaller muscles of the arms and chest are being used as much if not more so than the large muscles of the legs. You may find that your arms may tire before you have achieved a full 20-30 minute aerobic workout. This is the recommended time required to guarantee the proper conditioning of the heart and lungs. Therefore you have to perceiver more with a rowing machine than other pieces of workout equipment. However, when you get there you will be performing one of the best all-around exercises on the market. Rowing machines are very safe to use. You are low on the floor so falling off is not an issue. All the working mechanisms are well out of harm's way. However, you do need to think carefully if you suffer from back or knee problems. A rowing machine can be very good at strengthening the muscle of the lower back, however, if you suffer from disc problems or serious muscle spasm then a rowing machine could aggravate it. The same if you have trouble with your knees. The knee has to do a lot of bending and straightening during a rowing exercise. If unsure ask your doctor or physio. When buying fitness equipment, gym equipment or any type of workout equipment safety must always be a priority. A good rowing machine should be almost maintenance free. A well-designed rower takes normal wear and tear into account so that you don't have to. Cheap rowing machines do not. Most indoor rowing machines are pretty robust, but it's advisable to check what warranty is being offered on the frame, transmission and any electronics. Why should you buy your rowing machine from Powermax Fitness? Your rowing machine warranty: All rowing machines come with minimum 1-year parts and labor warranty. Many far exceed this with up to 3-year warranties, depending on the manufacturer. Rowing machines installation: Not everyone wants to build the rowing machine themselves that is why we can provide installation by our own engineers.